Bus from Ipoh to Cameron Highlands is a popular tourist bus route. Travelers will usually spend 2-3 days to stay in Ipoh before taking a bus to Cameron Highlands for a nature-filled adventure. Of course, many locals travel with the bus service between the two places regularly too. Perak Transit, Unititi Express and CS Travel are the operators for bus services from Ipoh to Cameron Highlands. Unititi is based in Cameron Highlands and is famous for bus routes heading to Cameron Highlands. All coaches are equipped with spacious seats and legroom to ensure the comfort of their passengers during the journey. There are daily departures for bus from Ipoh to Cameron Highlands which start from 8:00am as the first trip and end at 6:30pm as the last trip. The fare for bus from Ipoh to Cameron Highlands is reasonably charged, within the range of from RM 20.00 to RM 22.00 per ticket. The duration required for bus from Ipoh to Cameron Highlands is about 1.5-2 hours depending on traffic condition. The coach will meander through the winding road which is full of endless breathtaking mountain views. Passengers who have motion sickness are advised to take the front seat and bring along plastic bags and motion sickness pills because of the uphill and winding road to Cameron Highlands. The departure point in Ipoh is at Aman Jaya Bus Terminal Ipoh, after the closure of Medan Gopeng Bus Terminal since 2013. Aman Jaya Bus Terminal is about 10 minutes away from Ipoh city centre. Taxis and city buses are available for passengers to travel from Ipoh centre to Aman Jaya Bus Terminal and vice versa. The arrival point in Cameron Highlands is at Tanah Rata Bus Terminal. Tanah Rata is the hub in Cameron Highlands where you can easily find hotels, restaurants, drinking pubs etc. For those who want to go to Brinchang, it is just less than 2km away from Tanah Rata. Some people do walk from Tanah Rata to Brinchang, especially when they have no luggage with them. Medan Kidd Bus Station is a terminal serving Ipoh local city bus services. It is just located next to Ipoh KTM Train Station. Upon arrival at Ipoh KTM train station, you just need to walk about 500 meters to the Medan Kidd bus station where you can catch the city bus to Aman Jaya Bus Terminal. The city bus to Aman Jaya Bus Terminal costs about RM 2 only. 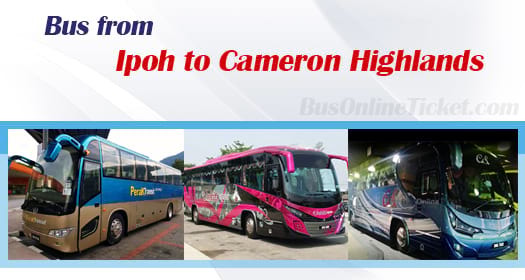 Due to the limited daily schedule, travellers are advised to book bus tickets from Ipoh to Cameron Highlands now with BusOnlineTicket.com in advance to avoid the disappointment of tickets being sold out. BusOnlineTicket.com is a credible and reliable online booking portal favoured by its customers throughout these years.